A good idea can change the world, so young entrepreneurs attending Wittenborg University’s Bootcamp for prospective IBA-students in Entrepreneurship & Small Management were swinging for the fence when they pitched their ideas. 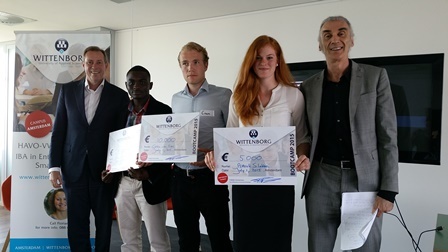 Up for grabs were scholarships ranging from €5 000 to €10 000 to study for an IBA in Entrepreneurship & Small Management at Wittenborg’s new Amsterdam location from September 2015. Ideas ranged from a web and app development business to making shoes with diamonds and sweat-free shirts. The Bootcamp was held in the new location, the UP Building in Piet Heinkade, featuring spectacular views over the Ij waterway and Dijksgracht. Though newly renovated, the building is already buzzing with start-ups. 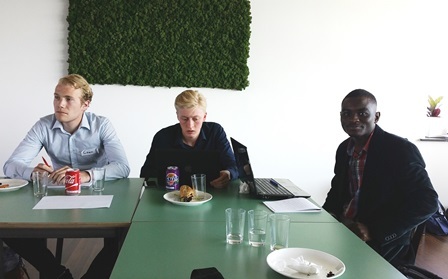 The energetic session was also attended by Wittenborg alumni who are looking to start their own businesses and perhaps the opportunity to work closely with the university’s incubator UP companies. 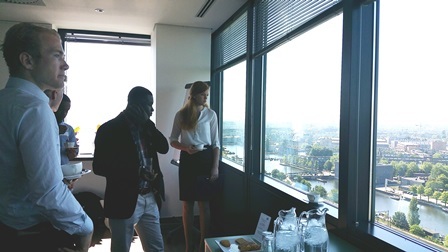 Not only did attendees gain exciting entrepreneurship experience for a day but also got to meet experts in the field of starting their own company. Eric Kyere, the runner-up, went for gold – literally – proposing to make shoes decorated with gold and diamonds for an elite client-base like celebrities and footballers. However he fielded difficult questions on his plan to produce these shoes in China instead of an established, luxe-shoes manufacturing country like Italy. 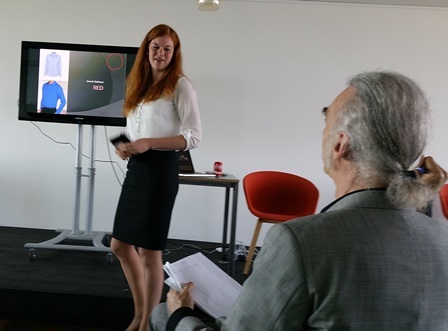 The youngest prize-winner was 17-year old Anouk Slabber who wants to develop shirts from a special textile which does not show-up sweat stains. The Bootcamp was lead by Wittenborg’s Dean of Amsterdam, Timo Timmerman. It started off with a talk by Wittenborg Amsterdam adjunct professor, Randy Bootland, who guided participants through the principles of a good business proposal and the pitfalls of presenting it to prospective investors. From September 2015 Wittenborg’s IBA in Entrepreneurship & Small Business programme will be offered in Amsterdam – in the creative heart of the capital city’s start-up scene. The programme is for students eager to start their own business but backed up with a solid degree and learning from experienced entrepreneurs while earning that degree. Timmerman said the programme focuses on entrepreneurship so graduates can start their own business or opt for a career in the industry as a corporate entrepreneur. "A substantial number will start their own business after gaining experience during the programme but can also be entrepreneurial in industry, work in a family business or start their own company later in their career. After the BBA continuing with your studies in a master programme is also of course a good option." Many classes are run as team competitions - helping students develop a broad range of intercultural, teamwork, leadership & communication skills. The academic programme will be complemented with top-notch student accommodation thanks to Wittenborg’s partnership with The Student Hotel in Amsterdam. Within 5 years Wittenborg’s Amsterdam Campus is aiming to have about 300 students, 25 lecturers, more than 50 associate and guest lecturers, 10 PhD researchers and a support staff number of about 15. More information about the programme and application details can be found here.